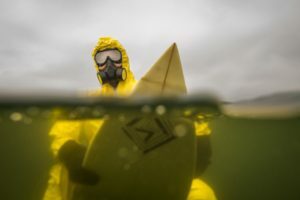 Scroll down for photos of HazMat Surfers. waste at the failed San Onofre Nuclear Generating Station. BACKGROUND In 276 days (see Countdown clock at Public Watchdogs) Southern California Edison will bury nuclear waste that’s deadly for 250,000 years in steel drums that are guaranteed to last fewer than 25 years (source document). The waste will be stored in delicate thin-walled drums that are thinner than the diameter of a dime. Each drum will hold 37 deadly nuclear fuel rods with the radiation equivalent of what was released at Chernobyl (about 9,3 nuclear warheads on average). The planned location will place the canister three feet above the saltwater table and 36 yards from the public beach. To date, all legal and regulatory efforts to remove the waste have failed … But there is hope. This event is in support of nuclear safety and sanity. We are asking for peaceful, conscious, responsible citizens to attend and support a positive solution to our deadly nuclear waste problems at San Onofre. It is vital that as the negotiations continue through late July, that the issue of nuclear safety remain in the public eye. receive constant and continuous public attention. Attendees will begin gathering at noon, a press conference will convene on the steps of the Hall of Justice at 1:00 PM. Public Watchdogs has stated publicly that a nuclear incident at the failed San Onofre Reactor is “unavoidable” (see brief video explainer). 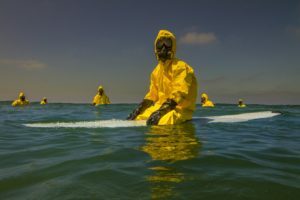 ANYONE who understands what has happened at San Onofre KNOWS that the threat of a nuclear situation at San Onofre is the single biggest public health issue facing the residents of Southern California today.